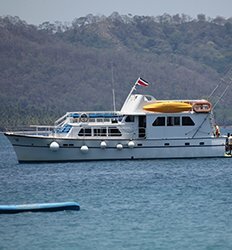 From the mangroves of Taracoles River to the gentle waves of the Gulf of Nicoya, The Real Deal Tours has just the boat tour in Jaco for your Costa Rica vacation style. 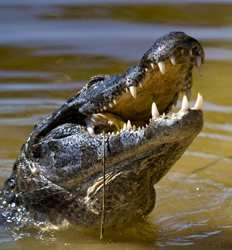 Nature lovers will enjoy our Tarcoles River Crocodile Safari boat tour in Jaco which is ideal for visitors looking for an activity that brings them closer to nature in a relaxing and delightful way! 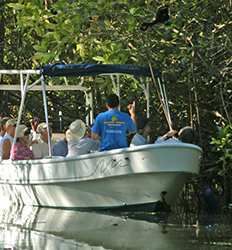 Jaco Eco Tours by boat are a great option for those who would like the opportunity to spot birds and crocodiles as well as the aquatic environment. 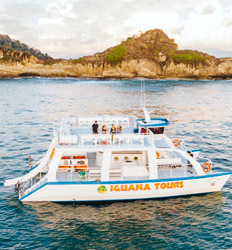 Jaco boat tours can also take you south on our Manuel Antonio Catamaran tour where you will have the opportunity to spot some of our most treasured marine life such as whales and dolphins. 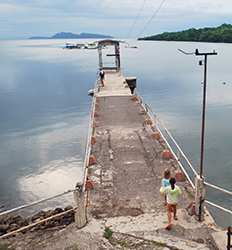 Cruise ship passengers and those staying in Jaco can both enjoy boat tours in the Gulf of Nicoya to island destinations such as Tortuga Island and the San Lucas Island Prison. Some of the boat tours in Jaco even include snorkeling and scuba diving opportunities so that you can experience the marine world from above and below the water's surface in the same tour! Below we have compiled a list of Jaco boat tours available to you in this region. Enjoy the beauty of Costa Rica's Pacific Coast by boat departing from beautiful Jaco!